Heat oil in heavy skillet over moderate heat. Add onions, garlic and chopped scotch bonnet; sauté until onions are translucent. 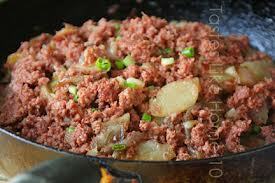 Add corned beef and thyme. Reduce heat to medium-low and cook, stirring occasionally until thoroughly heated. Add scallions and chopped tomato; cook two minutes more. Serve hot with Johnny Cakes, boiled green bananas or toast.